Tree Minder is a common Endurance creature card. It is part of the Core Set. 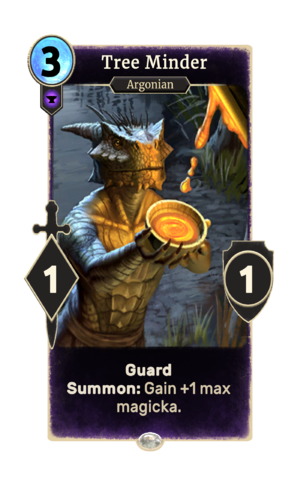 In addition to the card's availability in the Core Set, three copies are included in the Alduin's Apocalypse theme deck, three copies in the Black Marsh Smugglers deck, two copies in the Telvanni Ambition theme deck, and two copies in the Tribunal Glory theme deck. "The Hist shall heal you."